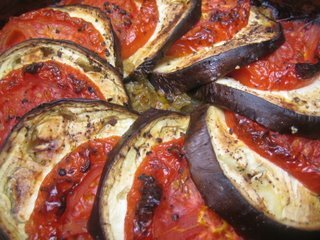 A vegetable dish for when you feel like ratatouille but it is too early in the season for all the ingredients to be plentiful in the shop so you only buy an aubergine and a couple of tomatoes because you just can't resist even though it is a bit early. I saw the idea for this in the Alice Walters book Chez Panisse Vegetables . It is a great way to serve aubergines and tomatoes, with their flavour bolstered by onion sautéed with herbs. The gratin is baked in the oven making it so easy to cook along side a roast chicken. Sauté the onion, garlic and herbs in the olive oil over a medium heat until soft and beginning to caramelize. Spread over the base of a suitably sized oven proof shallow gratin dish. Put a slice of tomato on top of each slice of aubergine and arrange nicely. If you have extra tomato or aubergine hide it under the matching slices or use it for another dish to leave the top layer looking nice. Prinkle with salt and pepper and a bit more olive oil. Cover with foil and bake at 200°C for 30 minutes then uncover and cook for another 15 minutes or until it is soft and cooked and begining to turn golden on top, there should not be any watery juices left. Yum! I say "Bring on summer and all it's wondeful, gorgeous fruit and vege!!" I'm the only one in my family that will eat aubergine. Love this dish Emma. Oh yes, summer, aubergines, tomatoes, basil . . . ! We just got back form Melbourne and, compared to Australia we are so lush a green - lovely! I even have a half red strawberry already . . . in the middle of Wellingtown!